(Original text written by Pela Moradia; the blog of a collective aiding urban occupations of the “movemento sem teto” (movement of those without roof) in Rio de Janeiro). Employees of the contractor hired by the city of Rio de Janeiro had the help of military police unit Pacification Police (UPP) installed in the Morro da Providencia (the oldest favela of Rio de Janeiro), in the city center to take the square Americo Brum, located within the community. The square began to attract public in 2008 when three young men were abducted by military personnel and handed in to a rival faction, which then killed the boys. The area is being requested by the municipality to start the building of the cable car (see other blogpost), which is part of the community redevelopment plan and the project “Marvelous Port”, a project for the regeneration of the port. This work will involve the removal of dozens of families. Together with the houses that the municipality claims to be at risk areas, the number of buildings to be removed comes close to 700. As has occurred in other areas of the city (currently 150 aproxidamente slums are threatened or in process of removal), there is no dialogue with local residents, who do not know exactly what will happen to them. The city did not provide details on the redevelopment project, much less explained the need to build a cable car. The only thing people know is that their houses are marked with the inscription “SMH”. The lack of information marks the relationship of government with the residents, who question the need for removal of houses. This morning, residents had scheduled a breakfast, as a form of protest against the order of the square Americo Brum and by not removing the housing. However, with the help of local police UPP, those responsible for works invaded and surrounded the square, preventing the entry of the residents. Importantly, this is the only recreational area in Providence, largely used by young children in the locality. Yet at no time was discussed with residents the need to end this living space, much less whether it would be rebuilt elsewhere. Just arrived, surrounded and prevented people to use. The municipality even respected the school holidays. Many young people, with this arbitrary action, will be without a space in which to meet and have fun, since there is no other place close by and free for leisure activities. Not only the right to information and housing, the municipal government breached the right to leisure, sociability as important to children and young people. Residents are preparing another protest at the moment. They think the form of treatment by the municipality is unfair and demand to be heard by the public. The example of the Cable Car in Complexo do Alemão has demonstrated the impact on the lives of the residents. Hundreds if not thousands of people are replaced, dumbs emerged where houses were removed, violation of privacy as the cars pass closely above the houses and rooftops, resident’s fear of height and therefore avoiding to use the cable car, etc. To my surprise, it has indeed been inaugurated two weeks ago, with the presence of a very proud president. A Dutch Newspaper (will add source later) wrote how this would benefit the community! However, for now, it only works between 10 and 14hrs, from Monday to Friday, thus prodiving a new form of leisure for the local youth rather than an efficient form of transport. As I have heard, though, these kids messing around in the cable car are loving it!! 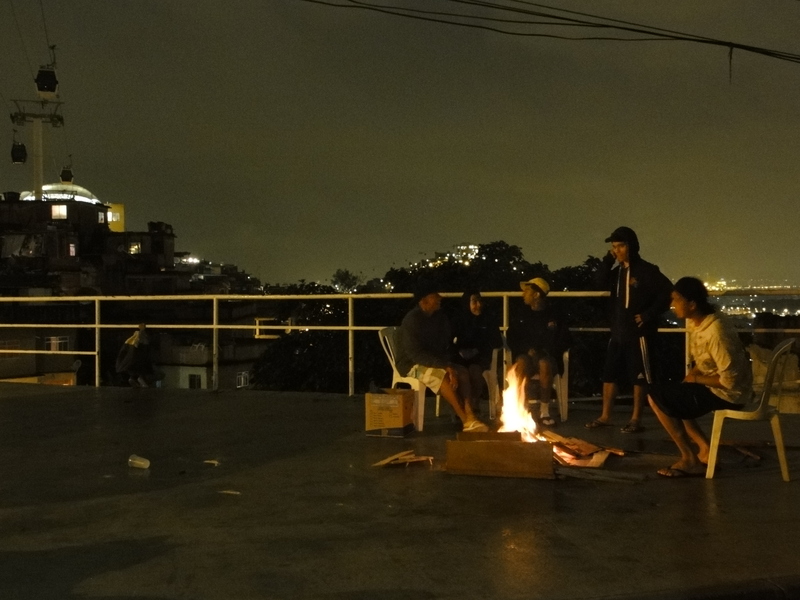 After the occupation of Complexo do Alemão in November 2010 – until then considered one of the “most dangerous” favelas of Rio – there is an increased interest from actors (public, private and non-profit) outside of the community. Especially digital technologies play an important role in this process. Community residents have recognised the interest from the media, large companies and the state in reporting about the local reality and doing “social work”. The favela has become pop. For the group of adolescents Descolando Ideias and Voz da Comunidade, and some other community residents active on Twitter, the Internet connects their community, to which the media until the occupation had very limited access, with the outside world. They want to communicate an alternative image, different than the usual image of violence, criminality and poverty. At the same time, they try to link to several (big) actors from outside (particularly Globo, Coca Cola, Santander (a private bank), AfroReggae (a NGO/social business)) to disseminate their information. Simultaneously, they try to establish partnerships with those companies, in order to get subsidies or donations. Another initiative – by Rene Silva, the guy who got famous after reporting via Twitter about the invasion in November 2010 – is the recently launched portal A Voz das Comunidades (The Communities’ Voice). The portal reports about events, issues and actualities in several communities. In this way, the voice of the communities is connected, producing content autonomously. The residents of several communities produce content which is edited by Rene and his team (Gabriela and Renato, both collaborators of Rene’s journal Voz da Comunidade). Today more than ever is the time for companies to invest in the favelas, areas that are now accessible and provide an enormous potential in terms of consumption. More than the public sector, big companies lie in wait to sponsor social/cultural projects. The group Descolando Ideias has already won a prize during an event sponsored by Santander, and are now moving into the direction of using this interest in order to guarantee the inclusion/entrance of these companies in the community through publicity, simultaneously informing the community residents about the services, products and opportunities (jobs) these companies offer. Thus, they use big companies to survive and to be able to make a living, and simultaneously they try to achieve social change. For instance, they produced an item on excessive amounts of garbage and the week after the municipality cleaned that particular area. Furthermore, after a couple of critical posts at the portal on abandoned playgrounds and holes in the streets authorities came to have a look. In this way, their communication articulates actors and events inside the community with the outside world. I observe how they try to maintain an “own” identity, representing the community, but at the same time the desire to be “included”, to establish links with actors outside of the favela. On the one hand they tend to communicate a “community identity”, through for instance the portal. Changing the image of the favela, bringing to the forth the positive side. However, whether positive or negative, the idea of the favela as separated from the rest of society is in this way reinforced. On the other hand, their links with big companies, the public sector, the media and NGOs in a way tear down this imaginary wall that used to divide two societies. In this way, these actors “ideologically” enter the community, while simultaneously this group of community residents tries to go beyond the boundaries of their community. That is, through linking to other actors (@Santander_br, @Cocacola, @sergiocabralrj) they claim a space to make their voice heard and they virtually expand their territory (the favela). It’s interesting how new digital technologies change the way in which community residents have a voice. The Internet certainly offers possibilities for Descolando Ideias and Voz da Comunidade, a tool they didn’t have before. Also, the “pacification” has definitely played a role, as the media has pointed their eyes on the favela, and thus discovered these adolescents. Complicated, however, is the fact that the majority of the residents in Complexo do Alemão (still) uses Orkut and MSN, which excludes them from participation in this “debate” and limits the community’s access to this information. That is, Descolando Ideias and Voz da Comunidade report on local – everyday – events focused on an audience outside of the favela, and simultaneously (especially Descolando Ideias) on the distribution of useful information inside the community. For instance: A new filial of private bank Bradesco has been inaugurated in Grota, one of the communities of the Complexo. This is necessary, as many residents aren’t aware of this and still go to other, more distant, neighbourhoods to pay their bills. But unfortunately, few residents access Twitter, Facebook and the group’s blog and therefore miss this information. A very amusing idea by one of the girls of Descolando Ideias is to take the streets with their laptops and create Facebook and Twitter accounts for anyone who passes by, thus increasing the inclusion of these residents in their activities. Besides the fact that people don’t know about these channels of information, this kind of community media is also devalued by the residents. The mass media (TV, Radio) still have a much bigger influence than new media. Yesterday in a discussion about the work of Voz da Comunidade and the portal someone mentioned that some residents prefer to send their stories to the mass media (f.i. Globo) than to the platform, thinking that the latter won’t have any effect. They also commented about some cases in which people don’t know Rene in person, but through a reportage on TV. This is an interesting – though not ideal – way in which the information distributed by these adolescents through the Internet returns to the residents of their community. I see a very important role for these communicators, as something that is seriously lacking in the community is information. There isn’t any channel of information that informs the community about issues such as the replacement of the army by the UPP, the inauguration of the cable car, the opening of a new bank, which are all events that affect the residents in their everyday life. I think it’s a crime to keep people ill-informed about events that have profound impact on their lives (such as for instance the replacement of the army by the UPP (peace police)! ), not to mention the fact that they usually don’t have a voice in the decision-making processes regarding such events/issues. The other day a functionary of the State Secretary of Human Rights came to inform the residents about their rights. She read out loud the rights listed in the UN declaration of Human Rights to the audience, but it struck me that she forgot to mention the Right to Information, which is seriously violated in the community. For now, however, Twitter and Facebook might not be the most adequate ways to disseminate information inside the community, and simultaneously, residents often don’t want to exchange Globo and its novelas for community media. Descolando Ideias and Voz da Comunidade, on the other hand, contribute to a different image of Complexo do Alemão, which in relation to an earlier post on the negative image of the favela, is very important. 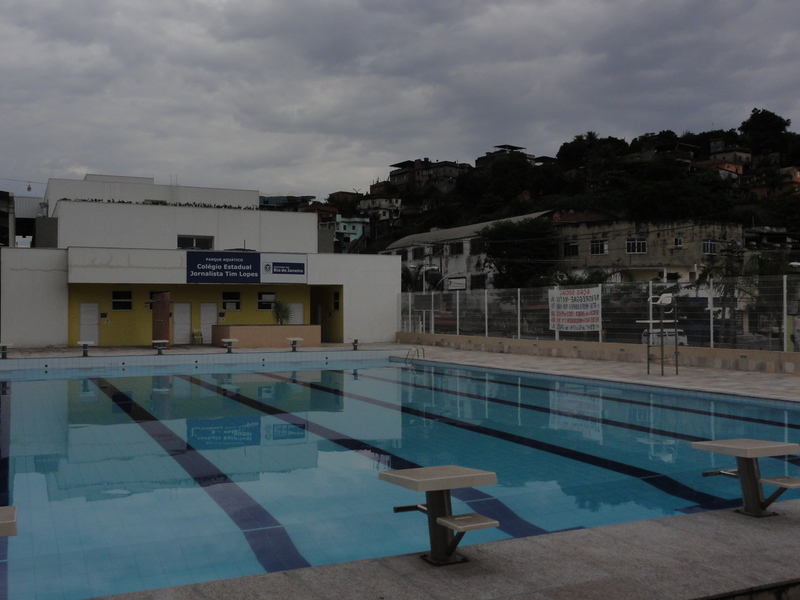 The public school/highschool Colégio Jornalista Tim Lópes at Estrada da Itararé in Complexo do Alemão hosts a big and nice swimming pool, meant for the students. But, due to a lack of lifeguards or teachers the pool has, since the school’s inauguration almost a year ago, not been used. Residents now claim the pool, and they’re right! Isn’t it their (public) money that is used for this pool? It would be a waste not to use it. Residents broke the cage and invaded the pool to find some refreshment on hot days. 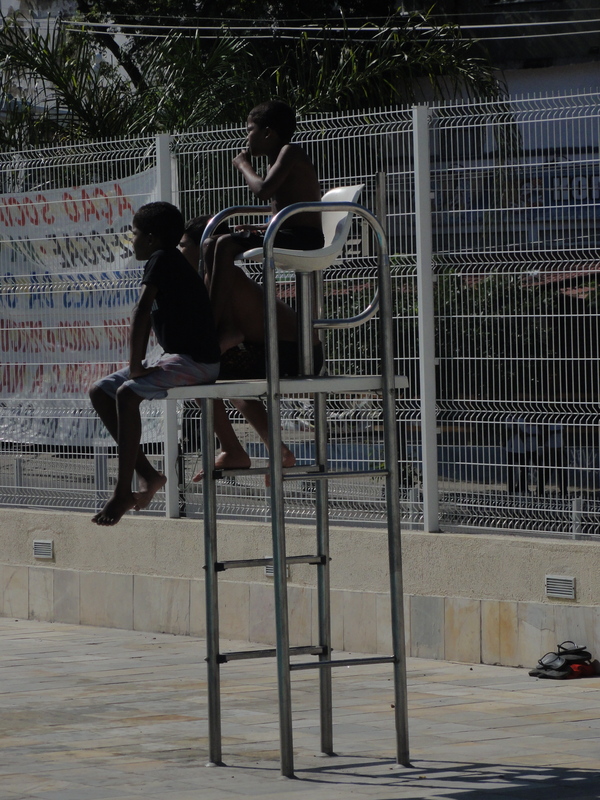 A couple of kids stay on the lookout for soldiers, who’ll punish them if they catch the kids in the pool. Last week I couldn’t withstand them calling me to join. I believe true ethnography is immersion. In this case, in the pool. The 7th of April nothing happened. The end of May nothing either; no precise date would prevent people from getting too many expectations. Sometimes we saw the cable car functioning, but that were only test drives. Now that June has arrived, new promises are made for the “end” of this month. Interestingly, I heard my neighbours talking about a group of strangers — “probably Americans” — who came to visit and inspect the cable car, and proclaimed that the thing would place the houses and buildings below its cables at risk. Meaning that all the houses below the cable car should be removed. That makes us wonder why a cable car, which has cost around a billion Dollars, if the houses have to be removed anyway. Why not a asphalted street? Or perhaps that wouldn’t even been necessary, as there already are streets. Asphalted, with well-functioning though informal transport (mototaxi, vans). Besides that, over the last couple of weeks more and more people tell me that they wouldn’t use the cable car anyway, as they are afraid of height. While transport is already functioning well in the community, wouldn’t it be more valuable to build a school? A university? A hospital? A library? …. Residents are starting to realise that the cable car will not be inaugurated, yet. Will it ever? What would Sergio Cabral (the governor) decide if it they really have to remove all the houses and replace the residents (which will cost another billion, if not more)? What weighs more, the shame of “cancelling” the increadibly expensive cable car and admitting that it’s a worthless thing, or investing another billion of dollar for the removal of the houses? Hopefully Cabral can face his error of implementing a useless object and save the houses of the many residents living below the cable car. Because it would be very painful to be forced to leave your house for a cable car which you would be afraid use. As I wrote earlier, residents — and I share their opinion — think the cable car merely as a tourist attraction. It’s a very impressive construction on the top of hill; you can see the stations even from the city centre (Complexo do Alemão is located in the North Zone, far from the centre). Moreover, it’s about the only construction on top of the hills, as most of the PAC projects are built below, near the asphalt. Apparently, as an architect told me, the focus on the lower part of the hill is justified as there’s a general consensus among urban planners that there shouldn’t be built anything above 100 meters because of ecological reasons (erosion, parts of the favela sliding down through heavy rainfall, etc.). Either this is nonsense and just serves to justify certain choices and interests (favela residents got furious when I discussed this with them: “They just want to remove the favela!”), or the cable car is build in areas of risk. In any case it’s contradictory, which is in itself is terrible as the favela isn’t a place for urban experiments, but the home of a large part of the population of Rio de Janeiro. 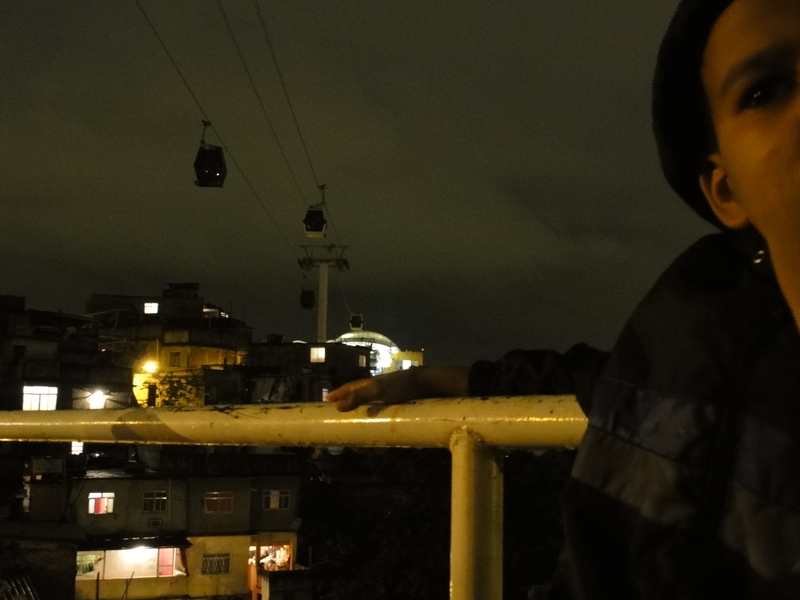 The cable car is a hot topic as it has radically changed the face of the favela. People are excited because it’s such a massive construction, and the inauguration will attract a lot of media attention, events and famous people to the community. However, for now and as always, the residents are left poorly informed, watching the empty cars passing above their houses. When? Before I started my research three months ago, I visited a sociologist based in Rio de Janeiro, Bernardo Sorj. We discussed my research topic and he warned me not to focus too much on the misery. “You Europeans have the tendency to focus on the bad things, making the favela seem like a miserable place”. In the past three months I have thought about his comment a lot. It’s being a struggle not to write about the misery, and simultaneously not to be too positive, or rather, naïve. In the case of the “pacification” – I still can’t write this word without parenthesis – there’s a lot of problems to report about, while the media only highlight the success of the initiative. Someone has to tell the truth, but.. Which truth? My friend Eddugrau always says “negativity attracts negativity, and positivity attracts positivity”. Therefore it’s dangerous to always criticise the current situation. Currently I am participating in a cinema course in Complexo do Alemão, organised by Cine TeleBrasil, and with a group of 7 adolescents we have to produce a short film. When we were discussing the topic of our film, one of the girls proposed to make a documentary on “Violence after the Pacification”, referring to the decrease of gunfire and homicides, but the simultaneous increase of burglary and domestic violence (violence against women and robbery used to be prohibited in the past, when the drugs gangs held power. This law functioned at the time, but today the soldiers don’t solve these kind of problems). This is something that hasn’t been disseminated by the media, and therefore an interesting and important story to tell. At the same time, however, the favela again is framed negatively. The media – who likes to scapegoat the favela – will pick this up and, perhaps, even distort the argument, causing more damage instead. An example in this respect is a news item by Dutch correspondent Marjon van Royen on the abusive behaviour of the UPP police (Pacification Police Unit) in the pacified community Cidade de Deus. She interviews two girls that tell how the police have inspected them, demanding them to take off their shirts and touching their intimate places looking for any drugs. I know that the cases she reports on do occur, as I have heard of similar stories in Complexo do Alemão (abusive behaviour of the soldiers in the case), and Providencia (UPP as well). However, rather than providing a constructive criticism, the video is very sensationalist. Such criticism is very dangerous. Not only does it put the girls, who openly and explicitly wish that the drugs gangs would return, at risk. The criticism is very ill-founded, offered without any contextual background. The Dutch audience now has this very negative vision about the situation, but who are the girls who express such criticism? What is their relation with the drugs gangs? Why would they tell such a story to a journalist they don’t know? Why not communicating a more nuanced story about the situation, offering several perspectives? Journalism is business and negativity sells.. The favela is framed as a dangerous, disorganised and barbarous place. Even today, after the “pacification”, people are scared to visit the community. On of the participants of the cinema course told me that when he got off the bus the first day in front of the community, he had doubted for a second. Shall I? Only when he saw the soldiers he took the courage to enter (after all he admitted that his fear wasn’t necessary at all). It’s the media that constructs this distorted image, stigmatizing the favela. Partly it is precisely this stigma that creates this imaginary wall around the favela, segregating the residents. The word “segregating” is rather radical, but I have experienced myself how you are not so much only physically, but also ideologically, excluded from the outside world. The friends I used to go out with in Lapa, Glória, Botafogo and Santa Teresa haven’t visited me once even though I have invited them several times. Not only because they are afraid, but also because this place I live is not seen as an attractive place to go (there aren’t any “good” parties, there isn’t any qualitative good music, etc.). The favela is never sold as a serious opportunity to go out or spend time. It’s this vicious circle of a division between the favela and the outside world hampering any interaction that reinforces the stigma. It’s in this way that negativity harms the favela. Negativity attracts negativity. This topic keeps me thinking a lot, and I don’t know the answer (yet?). Because we can’t simply neglect the inequality and discrimination, and the fact that the “pacification project” is lacking in many aspects. There’s a lot of “bad” things in the favela that deserve attention, but often the focus is too much on the favela rather than the cause of this misery. Instead of simply reporting on increased domestic violence, the victims and the perpetrators (those criminals!! ), it would be more interesting to focus on the ill-functioning of law and the absence of any juridical body inside the favela for the people to consult. In this way would the criticism more constructive? I’m about 5 weeks coming and going to “my favela” to talk with people, observe their behaviour, interview people and to try to understand the complexity of the Complex, the conjoint of the 14 communities that have been occupied by the army since November 2010. I have learned a lot about the local reality and the changes that are occurring in the last couple of months. I have also found a couple of interesting and urgent issues relevant to my research. Issues that help me to focus, and issues I wasn’t aware of before going there. However, there’s a huge barrier, a boundary, physical and mental, that hampers my “immersion” in the community. I feel that I have to live their lives in order to make sense of their reality. That’s why I’ve decided to move there. I am not really sure why I haven’t moved there in the first place. Not so much a question of not wanting to live there, but I didn’t realize at the time the necessity. And most of my friends who live in Lapa, Santa Teresa, Glória, lively and bohemian neighbourhoods, offered me plenty of rooms to rent. I am also partly working at the consulate, near to those neighbourhoods, which justified my choice to stay here, in this area. But over the weeks I am realizing that it doesn’t work as well as I had hoped. The physical boundary is the distance. It takes me about one hour to get to the community. Also, I depend on a handful op people that know about my research and see the benefit of it for their community (and therefore help me to talk to people, arrange interviews, etc.). People work very hard to make a living so usually they don’t have much time to talk to me. Simply going there and talk to people is much more complicated than I thought. Arranging visits is a very time consuming process, as my handful of people also work. The mental boundary is what bothers me even more. When talking to people they soon ask me where I live. “In Glória”. “Ahh, Glória.. Nice..” Yeah, why would I want to live there? I’m a Gringa, why would I prefer their community over the bohemian Lapa? And that is precisely what hampers my research. When I discussed this with my Brazilian roommate, she told me that she and her friend have a theory about foreign researchers. They have this obsession with the favela (and I guess so do I), but only for research purposes. When it comes to living, they prefer samba instead of funk. This is a real loss, because especially night life learns you so much about the day to day life of the people. Over a beer you really get to know someone and his or her stories. And in the bakery you see how people interact with each other. Suddenly this research project didn’t feel so good anymore. I felt not only the need, but also the obligation to move there. It doesn’t feel just to go their, acquire my data, and leave again. 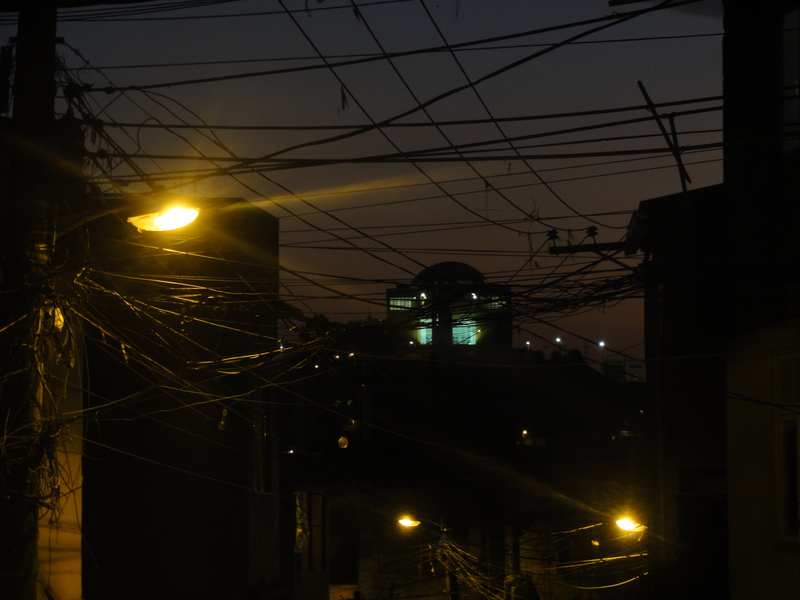 As you might have noticed in older posts, I write a lot about the divided city, the conception of the favelas as a different or separated society. Don’t I replicate this idea by living in “one part” and travelling to “the other part” of the city, thus indeed treating the communities as a different place? The idea that living there is “better” or “less exploitative” than not living there might be just a feeling rather than a well grounded scientific argument, as one might argue that I won’t be offering much in return. What will my research mean for the community residents? What will it change? Nevertheless, the least I can do is immerse myself as much as I can in their lives in order to write something that makes sense. I am very excited to move. The moment I told people I wanted to live in their community, most people react very enthusiastically. Everyone started to look for places to rent. They called all their friends and a couple offered me to stay in their house (their 12 year old son would temporarily sleep in their room). People are so warm, open and helpful. They wish you a good morning or a good afternoon. I can’t wait to buy bread in the nearby bakery. Especially at night and in the weekends the community awakes. Although life has become much more calm after the occupation (the army maintains order and prohibits parties and big gatherings of people), people gather on the streets, in bars, chat, play music and have fun. Kids play soccer and old men drink beer. And the view is amazing. Two weeks ago someone told me about the cable car (Teleférico) that was built in Complexo do Alemão after the occupation. From that moment it got my attention. I was curious to know more about such an installation as a means of public transport. Just imagine using a cable car as your daily way of transport to your work, or to visit a friend. This is the general reaction of people not living in Complexo do Alemão. “That thing is so going to improve their mobility”. 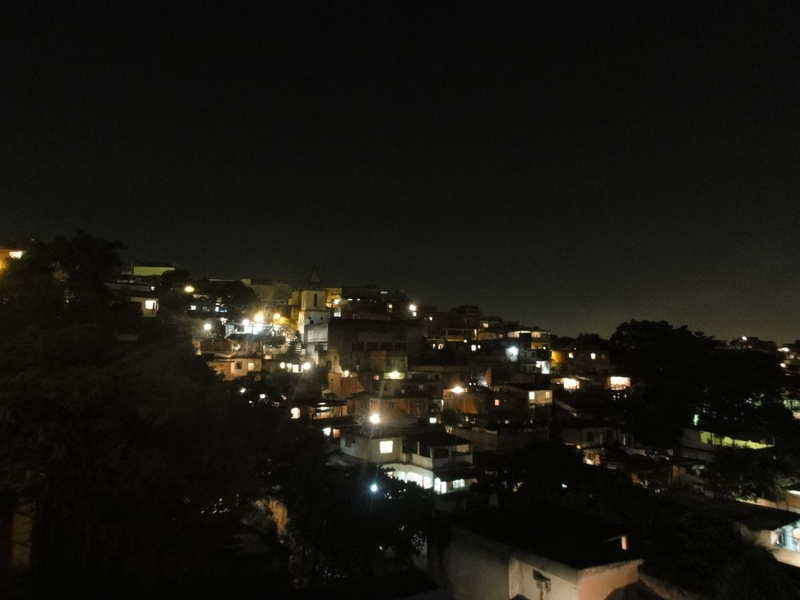 Last week, when I visited Complexo do Alemão for the first time, I got to see it. It’s not working yet, but I did see the cars moving as from time to time they test drive to ensure safety before the actual inauguration next month. I decided to try to take this “object” as a way to investigate the general opinion on the ocupation/pacification* of their community. 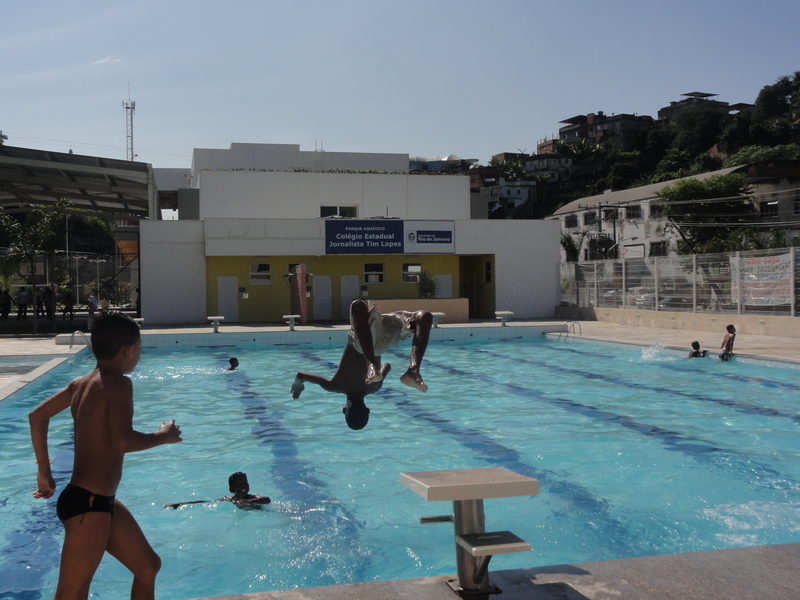 First some general information about the Complexo do Alemão. It’s a complex consisting of 14 communities and in total counts about 400.000 residents. That’s more or less the size of the third biggest city of the Netherlands. It used to be controlled by the Comando Vermelho until the invasion of the Brazilian army in November 2010. The invasion was the initiation of the PAC (Acceleration of Growth Program) and the pacification of the area. Different than the other communities that are being pacified by the UPP (pacification police unit – police that have been trained to interact with the community residents) Complexo do Alemão is occupied by the army. The pacification paved the way for companies to enter community. Commisioned by the municipality construction companies build apartments, squares, roads, stairs, and the cable car. Thus, the cable car is one of the many changes in the community, but it reflects a certain idea persistent in the community about the general approach of the project. People explain me that althrough the cable car will be the major form of public transport, there were built 5 stations in order to attend the entire community (of 400.000 people). I could also see by myself that the cars, equipped with no more than 6 seats – in buses passengers not necessarily need a seat, in a cable car I imagine they do – don’t move very quickly. The capacity to transport the amount of people is doubtful. I could also perceive a certain distrust or resistance towards the stations, which serve as the bases of the army. People told me how the stations are strategically positioned rather than facilitating the transport within the community. If it really were to benefit the community residents they would have been asked where to build the stations. Instead, they feel their opinion and knowledge of the structure of the community is neglected. Besides the idea that the cable car does not really match their needs in terms of transport, people explain me how it could possibly generate the community. People could have stands inside the stations and sell goods (e.g. Food, drinks, snacks, movies/cd’s, etc.). As far as they know, however, this is prohibited as the stations are owned by the cable car company, which will not allow these types of commerce. When I ask them why they think the cable car has been built most people answer: “for the government to show the favela to tourists”. It turns out that the cable car in Complexo do Alemão serves a cable car’s more common function as a tourist or fairground attraction. It responds to the increasing popularity of “the favela” by NGOs, social projects, artists and tourists (see: favela tour). The people I spoke with do not reject this curiosity about their way of life at all. They just want to have a voice in the way their life is exposed to others. Not to be used as an object of tourism, but to interact with visitors, to learn from each other, and establish mutual understanding and knowledge about their cultures. And if possible, to have a share in the profit. Only than development can be sustainable and fair. And about the pacification and development of their community? A similar answer returns often. They know their community best. Why aren’t they consulted about what works best in their community? I wonder what will happen next month. Will the cable car be used by the local residents? Will it really be a tourist attraction? I’ll keep you posted. * Note the controversy: occupation and pacification are supposed to go hand in hand in this context.